Westringia longifolia is an open, upright shrub that reaches a height of two metres in our cold climate garden. Leaves are bright green, linear and about three centimetres long. In typical Westringia fashion leaves are held in whorls of three. Flowers are about two centimetres across, pinkish in bud and opening to white. Spring is the main flowering period but some blooms are carried at other times. They are often profuse and highly conspicuous. Light pruning is appreciated. 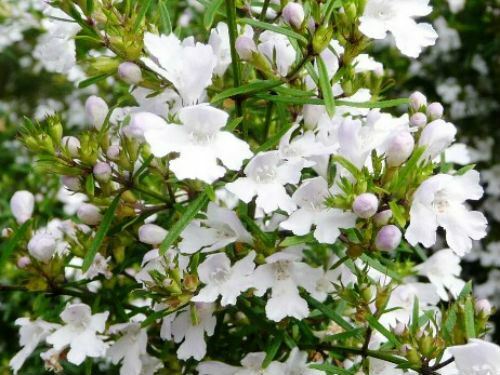 W. longifolia is one of the best white-flowered native shrubs and could be grown in the foreground of garden beds. In NSW, W. longifolia occurs in coastal, tablelands and western slope areas. The species is also found in southern Queensland. W. longifolia was first grown in England in the early 1820’s. Cuttings produce roots readily and rapidly. Westringia longifolia is a member of the Lamiaceae family in company with the Prostantheras and culinary mints. 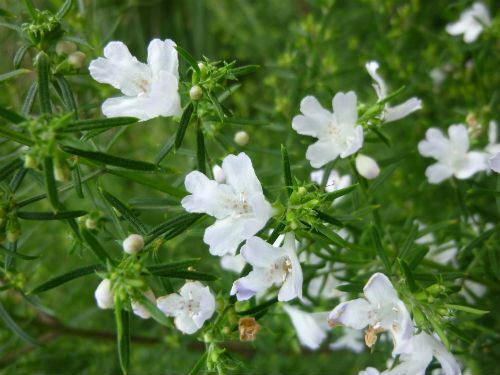 It can be found growing naturally in moist shrub land, creek and river banks of the Georges, Colo and Bargo Rivers. It was one of the first Australia native plants that I planted in my garden in the northern Sydney suburb of Westleigh over 30 years ago. In those days it was called Westringia linifolia, maybe because of its linear leaves to 3 cms long. I have now planted a few more as they are a slender shrub that is quick growing, tough, long living (around 20 years in my garden), drought tolerant and a little frost hardy. On maturity, they form a medium dense shrub up to 2 metres tall by 1.5 metres wide. The singular flowers are mostly white although there is a form with pale blue flowers, which in my opinion makes for a much more attractive plant when in flower. The flowers are borne prolifically in late winter to early summer. While the flowers do not attract birds they are attractive to native bees. Westringia longifolia grows and flowers best in full sun and well-drained soil. They grow well in dappled light but are not as prolific in flower. They are also a good hedge plant as they will take some pruning, but not too severe as they do not always shoot from old wood. For those interested in botanical art, a hand color print of Westringia longifolia appeared in the 1820s London publication, "The Botanical Cabinet" which was a large paper edition of 2000 coloured plates of rare plants introduced into its hothouses and gardens from around the world by Conrad Loddiges (1786–1846). The Loddiges family managed one of the most notable of the eighteenth and nineteenth century plant and seed nurseries in the village of Hackney, north of London that traded in and introduced exotic plants, trees, shrubs, ferns, palms and orchids into European gardens. Westringia: Johan Peter Westring (1753-1833) a Swedish writer on Lichens and a Physician to the King of Sweden.